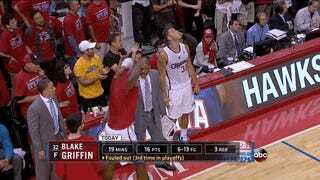 Blake Griffin fouled out with 48 seconds left in the game, and the score tied 105-105. It was kind of a ticky-tacky foul and Griffin was reacting to the video replay. He lifted his arms in exasperation and dumped the water he was holding all over the guy in a Warriors shirt behind him. Then he threw the cup at him.